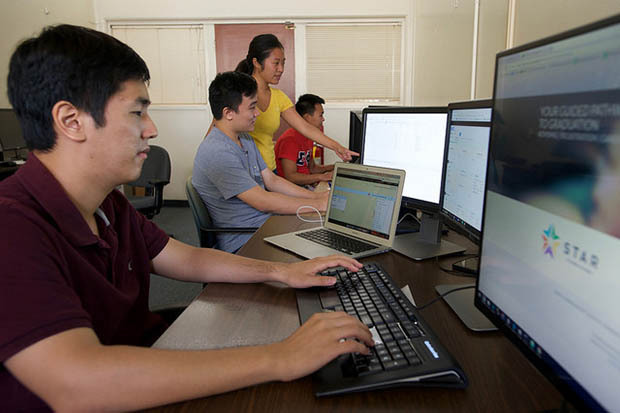 STAR GPS, a new registration application designed and created at the University of Hawaiʻi, is now available to all UH students in the 10-campus system. The STAR GPS app was designed to assist students similar to how the GPS in a car assists drivers, by laying out the optimal pathway to their destination: graduation. STAR GPS knows every student’s academic history and every academic program offered at UH. During the app’s trial run, students lowered the average number of credits taken that didn’t count toward their degrees from 22 percent, about the national average, to just 4 percent. Students not only tested the app, but were also significantly involved in its design and development. STAR GPS is the latest version of the nationally recognized STAR system. STAR is one of the UH Mānoa initiatives credited with a recent 80 percent increase in school’s four-year graduation rate over a six-year period. Now STAR GPS also guides the university by identifying courses in high demand as students register, so the school has the time to meet those needs. STAR GPS-registration will be in full use across the UH System for summer and fall 2017. Start planning for fall STAR GPS registration or call the STAR office at (808) 956-4036.